Hailing from the north-east of England, this group of young jazz virtuosos was birthed in the youth jazz ensembles sponsored by the Sage Gateshead and mentored by Paul Edis. 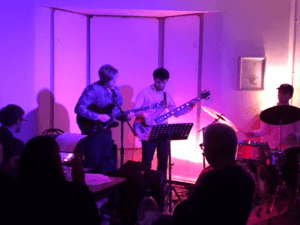 The Francis Tulip Quartet was formed in 2017 and immediately made a big impact on the local jazz scene. The quartet comes together in summer and winter for recitals and recordings and in the meantime its members disperse to various prestigious music colleges in the US and UK in order to perfect their skills. The band’s annual working pattern ensures the regular injection of fresh ideas and has been a recipe for many exciting and original takes on bebop classics. The Quartet are back this summer with a combination of covers of classic and contemporary jazz tunes together with some original compositions penned by the band members. As band leader Francis brings influences from modern jazz, through jazz funk and classical music with melodic solos which have wowed many an audience. Joel Brown compliments Francis’s melodies with piano skills influenced by Evans, Monk and many other Jazz giants. Michael Dunlop (Electric Bass) and Matthew MacKellar (Drum Kit) provide swing and groove as appropriate and contribute a variety of inspired solos to add mood and colour to the ensemble’s pieces. Described by the local jazz reviews as “something special” and “the next big thing”, don’t miss this opportunity to see one of the region’s emerging jazz talents come into its own.